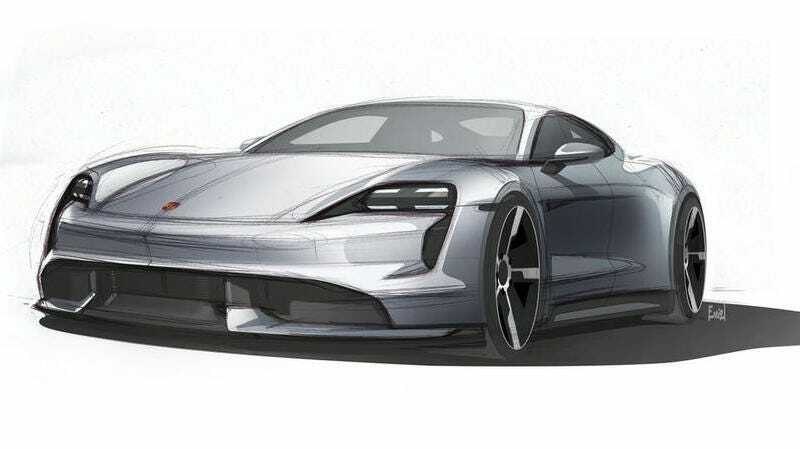 The 2020 Porsche Taycan will finally be revealed in production form later this year, and to celebrate, Porsche reportedly sent around the latest and possibly final design treatment for the hotly-anticipated electric sedan—and it looks absolutely fantastic. Where the Mission E concept looked stunning but maybe a little over-large, bulbous, and Neo’s-mouth-from-that-scene-in-The-Matrix, this latest sketch sent to us by the good people over at Taycanforum.com shows something a little more sleek, a little more sporty, and a little more breathable. And we all know what happens to many cars as they go from concept to production. The car sports the now-ubiquitous four-point headlight treatment, a tweaked lower intake with new fins breaking up what’s likely a cooling intake, a more-defined edge on the nose, and a rear-end treatment that’s very reminiscent of the new 992 911 styling, just perhaps executed a little better in this exaggerated sketch. Our start to 2019 is charged with excitement. This is the year when the first all-electric Porsche will become a reality. The Taycan is certain to enthrall not only test drivers, but also our customers with its performance. When it rolls off the production line and onto the roads, it will offer a true dynamic Porsche driving experience like every Porsche before it. The email also included a link to download the sketches as desktop wallpapers, which you can access here. Previous reports indicated Porsche had to scale up production expectations from about 20,000 cars per year to closer to 40,000 a year, reportedly hiring 1,200 additional workers to make it happen. That bigger production number would make the Taycan a better seller than the 911 model was last year, so things are looking good for the automaker’s electrification plans. We’ll just have to see how it impacts Panamera sales. Performance specs are expected to be announced a little bit closer to the Taycan’s official reveal, but it’s been said to have around 600 horsepower pounded out by two motors, with 800-volt charging technology that should be capable of juicing up 60 miles of charge in just four minutes and a range of around 300 miles. The car drops in September, and I can’t wait.